(1987) graduated from the Aleksander Zelwerowicz National Academy of Dramatic Art in Warsaw, where she now works as a lecturer at the Department of Theatre Studies. Deputy chair of the Polish Association for Theatre Studies and member of the journal Teatr’s editorial team. Along with the present journal, her articles have appeared in Didaskalia, Dialog, Performer, on dwutygodnik.com, in Svet a Divadlo, Yorick, Rzut, Art & Business and in academic monographs. The participatory aspect of the creative process is among her main interests (practical as well as research). 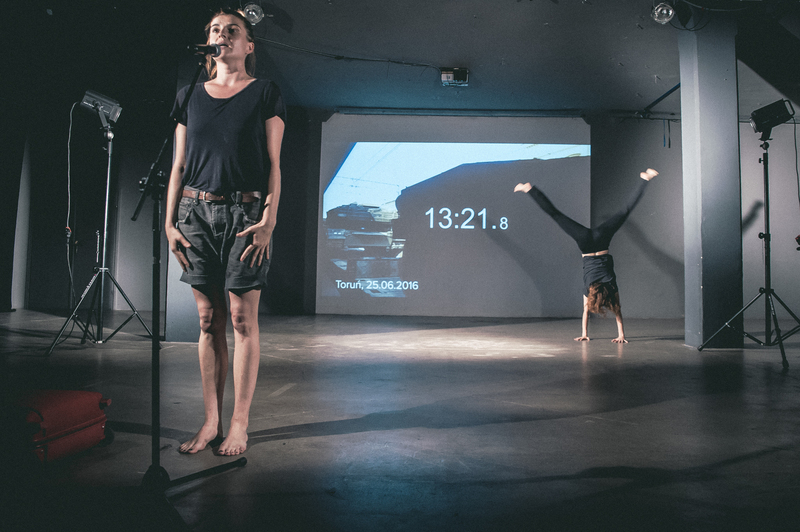 An urban performer and author of urban social projects, she has collaborated with the Rimini Protokoll collective and with Edit Kaldor on participatory theatre projects. She has worked as an assistant for director Erling Jóhannesson. She is working on a doctoral dissertation about the current situation of craft in theatre. theatre pedagogue and director. Graduate of post-graduate programme of theatre pedagogy at Universität der Künste in Berlin, the special-education programme at the Nicolaus Copernicus University in Toruń and Theatre Studies at the National Academy of Dramatic Art in Warsaw. Scholarship holder of Gemeinschaft für Wissenschaft und Kultur in Mittel und Osteuropa, Germany, and Deutscher Akademischer Austausch Dienst, Germany. She is the head of the department of theatre pedagogy at the Theatre Institute in Warsaw. Founder of Teatr 21 and co-founder of the Association of Theatre Pedagogues. In collaboration with Zofia Dworakowska, she manages the Post-Graduate Course in Theatre Education, a collaborative project of the Theatre Institute in Warsaw and the Institute of Polish Culture at the University of Warsaw. She teaches in the Academy of Dramatic Art in Warsaw. Curator of the project ‘Więcej niż teatr’ [‘More than Theatre’] at the Grotowski Institute. In 2016, she received the Kamyk – the Konstanty Puzyna Prize, awarded by Dialog and the Book Institute. theatre scholar and dramatist, graduated from the Faculty of Theatre Studies of the National Academy of Dramatic Art in Warsaw and the doctoral programme of the Institute of Polish Culture at the University of Warsaw. Member of the research projects ‘HyPaTia’ and ‘Dorman. Archiwum otwarte’ [‘Dorman: An Open Archive’], conducted at the Theatre Institute in Warsaw. In her work, she combines a theoretical perspective with theatrical practice. From 2011 to 2015, she worked as a dramatist in the Studio Theatre in Warsaw; since 2012, as a dramatist in Theatre 21, where people with Down syndrome and autism act. She also cooperated with the Dramatyczny Theatre in Warsaw, where she co-created productions including Per Gynt. Szkice z Dramatu Henryka Ibsena [Sketches from Henryk Ibsen’s Drama], Klub Polski, Córeczki [Daughters], and with the Polski Theatre in Bydgoszcz and with TR Warszawa. Author of dramaturgy and co-author of the script of the play Ciało pedagogiczne [Teaching Staff] directed by Justyna Sobczyk. She co-authored the play Kalina about actress Kalina Jędrusik (Polonia Theatre), and Jak nie teraz to kiedy, jak nie my to kto [If Not Now, When; If Not Us, Who], published in the anthology Transfer! Teksty dla teatru [Transfer! : Texts for Theatre]. Member of the Theatre Educators Association. JAN DORMAN'S THEATRICAL PLAYGROUND, directed by Justyna Sobczyk, dramaturgy: Justyna Lipko-Konieczna, premiere: 13.10.2012, produced by Zbigniew Raszewski Theatre Institute in Warsaw. Photographer: Marta Ankiersztejn. The conversation with Justyna Lipko-Konieczna and Justyna Sobczyk summarises the ten-year history of establishing theatre pedagogy in Polish institutional theatres in which they've played key roles. It also attempts a critical reflection on assumptions and values which are fundamental to theatre pedagogy, such as community, creative process and its anti-hierarchic character. The interviewees are pioneers in contemporary Polish theatre pedagogy. They refer to democratic values which are constitutive for their activity, and discuss these in the context of contemporary political changes in Poland. Based on their artistic projects and workshops they've conducted, they talk about difficulties and challenges faced by theatre pedagogues, as well as discussing the range of responsibility they have towards their own institutional environments in schools and theatres. Theatre pedagogy as a systematically developed field of animating activities in theatre institutions and schools has been established only recently in Poland. The symbolic beginnings can be traced back to the TISZ [Theatre and School] project initiated by the Zbigniew Raszewski Theatre Institute in Warsaw in 2006, which consisted of cooperation between schools and theatres. 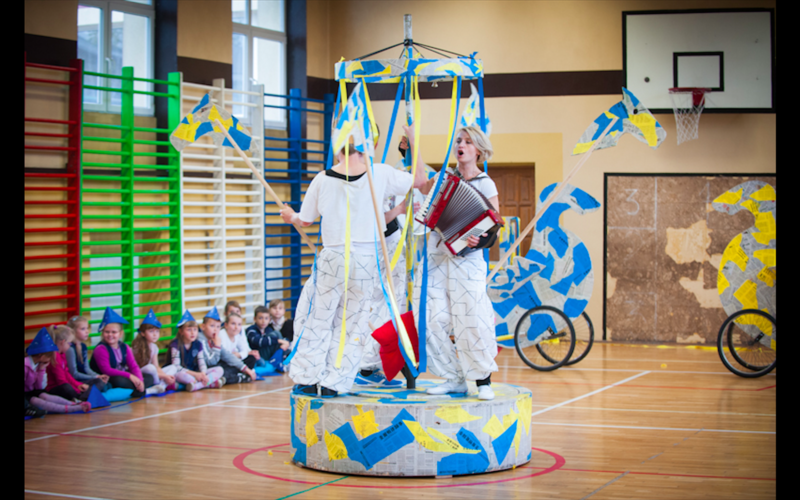 TISZ included workshops conducted by theatre pedagogues from Germany, and later also study visits by Polish teachers to Berlin. The project was inspired by the Berlin project TUSCH [Theater und Schule]. 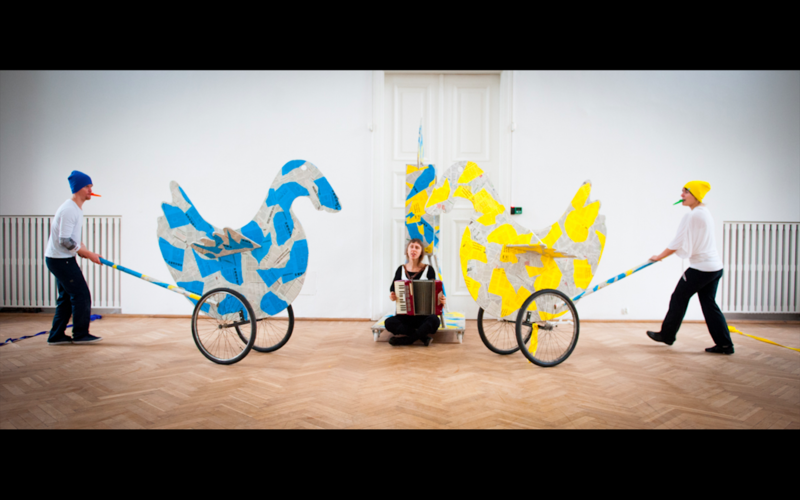 It was initiated and co-created by Justyna Sobczyk, at the time a recent graduate of theatre pedagogy at Universität der Künste in Berlin. The very low level of awareness of the need for educational activities among representatives of theatre institutions participating in TISZ was evident in the title of a panel discussion: 'Is There a Place in Theatres for Theatrical Education?' That discussion took place after initial training sessions for employees of the theatres involved in the TISZ ANEX project planned for 2007. Sobczyk, employed since 2005 in the newly established the Theatre Institute in Warsaw, would within a decade develop a circle of specialists, implementing many programs related to theatre pedagogy and inciting a discussion in the theatre community concerning objectives and methods of theatre pedagogy. As a result of a subsequent stage of the TISZ project, the Association of Theatre Pedagogues was established in 2010.1 The third edition of the Post-Graduate Course in Theatre Education, with which Sobczyk collaborates, will take place in 2017. The course is a collaborative project of the Theatre Institute and the Institute of Polish Culture at the University of Warsaw. The curriculum combines methodology developed by German theatre pedagogues and the approach characteristic to the anthropology of performance, a field researched and taught at the Institute of Polish Culture. Since 2005, Sobczyk has been running Theatre 21,2 which is created by people with Down syndrome and autism. She regularly collaborates with the playwright Justyna Lipko-Konieczna in both theatre and workshop activities. Along with numerous productions by Theatre 21, the two pedagogues created the production Teatralny Plac Zabaw Jana Dormana [Jan Dorman’s Theatrical Playground], referring to ideas of Dorman, the innovative yet now-neglected creator of post-war theatre for children, and have staged two productions in institutional theatres: Ojczyzna [Fatherland] by Krystyna Miłobędzka at the Polski Theatre in Poznań in 2016, and Witkacy's Szewcy [The Shoemakers] at the Stary Theatre in Kraków in 2017. Zofia Smolarska: When I listen to conversations among the community related to theatre pedagogy – for example, debates during the recent conference 'Theatre Pedagogy: Directions, Reflections, Perspectives' organized in November 2016 by the Theatre Institute here.I get the impression that the field in Poland is fuelled by several myths. One is the myth of community. You said during one of your conversations: 'The objective of a theatre pedagogue is to make each participant feel like a part of something bigger and at the same time make sure that they feel accepted [...]. A theatre pedagogue wants the participants to discover the commonality during proposed activities'.3 You gave examples of exercises you usually suggest at the beginning of a workshop: participants walk around the room, shift their gaze from one person to another, welcome each other by shaking hands then look for other ways of welcoming, eventually finding out each other's names. Another phase consists of finding a common rhythm of steps. I know this exercise from workshops conducted by Polish alternative theatres – the Village Theatre 'Węgajty' and Teatr Dnia Ósmego [Theatre of the Eight Day], created during the counter-culture wave – but also used by therapy groups working with drama therapy or in the Forum Theatre. Suggesting such exercises at the beginning is based on the assumption that such community and need for acceptance is a value desired by all participants, which in this moment is the most important one. Situations I find particularly problematic are those in which projects beginning with community-building are related to such subjects as the Holocaust, death, broken relationships, lack of acceptance. Don't you think that beginning that way could eliminate conflicts and tensions brought in by participants, or which may have already developed within the group? Justyna Sobczyk: The workshops usually begin with conversation and introductions. We also say where we came from, that we're those girls who 'work with the Downs', as we're often described. When we start working, even in case of subjects you've mentioned, I want all of us – we who're conducting the process, and participants ­– to see the space we're in and who else is there. The objective of these first exercises is simply to see each other. Often participants don't come alone, they come with other people they know, and it's very difficult to separate those pairs or threesomes, because people are afraid to distinguish themselves. Recently, when I was conducting classes in the Academy of Dramatic Art [in Warsaw], I told my students: 'These initial exercises are a kind of formula which can help you, and if you practice it you'll see that a moment will come when you'll feel like abandoning the formula and beginning with something else'. These exercises also introduce order and build the initial structure of the workshop, but they're also meant to emphasise that all participants have equal right to be in this space. Therefore, the arrangement of the space before the workshop is important. I often come into a space arranged like a classroom. Even when we engage with participants in common activity such as moving desks so we can sit in a circle, a problem arises because there's a place beside the instructor and nobody wants to sit there, so there's a gap in the circle between instructor and participants. Nevertheless, it's an invitation to reformulate this situation. Justyna Lipko-Konieczna: You've mentioned the common rhythm. It's not that we're unaware of that ideological instrument. Being in a common rhythm can subliminally adjust the group. But the fact that we initiate activities which develop awareness of the rhythm doesn't mean this rhythm is used in only one way. It's about seeing whether I'd easily go into that common rhythm, and what'd happen if I broke this rhythm. However, when it comes to building a common space, I think it should be said that we still don't have a tradition of public space in Poland. I also have in mind the culture of public space, thanks to which we as individuals have a personal attitude to space. Hence the question – a simple question, it would appear – which we ask participants: 'Look at the space you're in'. It directs their attention not only towards the place itself but also towards the group of people who shape this place, and makes them think about ways this space influences the functioning of the group. ZS: But in a situation in which the workshop group works in a classroom where the space is divided into teacher's desk and student desks, starting by arranging chairs in a circle may result in a lost opportunity for common reflection about the space – which is, after all, one context for participants' everyday activities. If I understand the assumptions of theatre pedagogy correctly, it's about making participants take responsibility for social relations, not about imposing the new, improved, more democratic – according to the pedagogue ­– order on them, as if the change had already happened. Such actions carry the risk of 'forced' empowerment, which may bring effects that're opposite to the intentions. THE SHOEMAKERS, inspired by a play by Stanisław Ignacy Witkiewicz, directed by Justyna Sobczyk, dramaturgy: Justyna Lipko Konieczna, premiere: 11.03.2017, Helena Modrzejewska National Stary Theatre in Kraków. Photographer: Marta Hueckel. JS: This question is related to what I care about, and what the subject of our conversation is. If the subject of the workshop is school, power, space, then yes, the gesture of moving desks and chairs at the beginning is obviously strong and takes away from the group the opportunity to critically look at and experience the place in which we are. In theatre, we're often confronted with a similar strongly hierarchical situation. The space always awaits us, as it did in the Stary Theatre while we were working on The Shoemakers,4 where we found a rehearsal room prepared with a place for a director on top of a table. So in Kraków [at the Stary], I suggested arranging tables in a square to eliminate the problem of my being at the head. This gesture resulted in a question I posed during the first rehearsal, which was totally out of the directorial order: 'How do you feel?' I didn't realise the power of this question, but it became crucial. For me, the first meeting can be very important and everyone who's with me in the space is important. The simplest gesture that demonstrates my attitude is that of creating a space in which we all see each other. ZS: Do you remember a project by the visual artist Artur Żmijewski, Oni [Them] from 2007?5 Żmijewski initiated working on symbols with four groups: socialists, young Polish Jews, bigoted old ladies and members of an organisation with nationalist tendencies, Młodzież Wszechpolska [All-Polish Youth]. Each group could freely interfere with symbols important to others. Additionally, the artist antagonized participants by marking them with T-shirts, as with football teams on a field, which made it impossible to build a sense of commonality 'across the divides'. The project ended in conflict and with the total destruction of symbols. Would you recommend such activity to your students in the Post-Graduate Course in Theatre Education? JS: Obviously, students learn about various artistic practices co-created with communities during the course. We want them to know various strategies used in artistic practices. As part of our course, I teach the subject 'Applied Theatre' and share ideas and practices worked out so far in Theatre 21. Theatre 21 is definitely a team theatre, practising the idea of community for twelve years and facing challenges this formula presents. I admit I'm very interested in searching for good practice within the arts, translatable into the sphere of social life, the activities of building a community, or rather a 'differenity'. I personally care very much about that, and with Justyna in performances we've co-created so far, we've been exploring this issue, whether for children or for adults. That's the way we staged Fatherland at the Polski Theatre in Poznań. In this performance, children build a construction from cardboard boxes, audience members can add their own cardboard boxes and at the end each viewer can take the box home. This is an image I believe in and I want to create conditions for creating rather than for destroying. The Fatherland actors tell me they love performing in the production because it developed a bond between them. They like to be close to one another, though usually they perform in other productions. Another reason I like this production is because the ending provides hope. JL-K: In actions based on agon, you have to be fully aware of what you initiate. 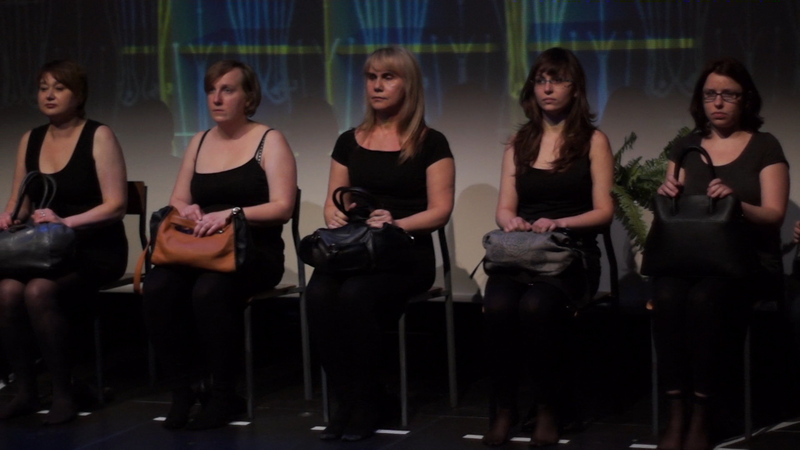 Many activities in the field of theatre pedagogy are based on agon – for example, Ciało pedagogiczne [The Teaching Staff], which resulted from workshops for teachers, and in which eight female teachers and one male teacher performed. The idea of the workshop had been to give teachers instruments for creating a theatre performance with their students, to whom they were supposed to give voice. However, at one moment participants decided that they wanted to express their own voices through the theatre medium because teachers are, in fact, the group which has no voice. The main subject of the production was occupational burnout experienced in the current school model, which leads towards melting into the system and almost total identification with it. The work was very difficult because it required from participants a critical look at their own roles, squeezed into the education system, and a confrontation with benefits they get from functioning within a school model they don't really accept. Many of the exercises we proposed wound up in an unpleasant confrontation with the reality in which the teachers function, and breaking the illusion that someone else can instigate change for them. THE TEACHING STAFF, directed by Justyna Sobczyk, dramaturgy: Justyna Lipko-Konieczna, premiere: 29.05.2015, Zbigniew Raszewski Theatre Institute in Warsaw, Photographer: Wojciech Kaniewski. Towards the end of our work, during one rehearsal, participants admitted that they didn't feel capable of initiating change themselves because it held considerable risk. Their conformity was at odds with the romantic myth of a teacher who has personality, who proposes the individual approach, is charismatic, etc. In many ways, it was a very painful process. Approaching the end, when the shape of the performance had already appeared, one participant expressed her doubts about its message, which didn't provide much hope for evolution within the educational system because no one in this group of teachers felt willing to take responsibility for the change the performance offered. It did, however, offer change, and was a result of our common work: to abandon bureaucracy and the necessity of filling out tons of paper under which teachers drown, for the benefit of developing subjective teacher-student relations. I look at it today in the context of the new education reform [passed by the Polish parliament]. The current battle is about values, because changes to the core curriculum make such categories as tradition, Polishness and patriotism unambiguous.6 But protests by teachers are only arising now, after consultations and preparations for the reform had been going on much earlier. This kind of delay and disorganisation, along with an undercurrent of systemic fear, was present already in The Teaching Staff. At the time [spring 2016], we decided to insist on not changing the significance of the performance because it was the result of the process. Sometimes one is tempted to forget or abandon some issues, but we stick to the rule that we are faithful to the working process. We record many rehearsals, write down participants' statements, and the voice of each participant strongly influences the content of performances. A theatre pedagogue accompanies this process, but doesn't direct it. ZS: It seems like you are in a way mythologizing the process, presenting it to instructors and participants as something autonomous. Would you agree? You've assumed this is the truth about the process and that what was said before has to be protected from the participant – yet her need to change the ending was also part of the process. Therefore, the theatre pedagogue here becomes a person who decides what gets to be part of the process and what's left out of it. It's understandable, since we can't take every element into account, so we choose what we believe is important. But you not saying 'This is important for us and we want to keep it' but 'This is the truth about the process'. JL-K: But what the participant had said also became an element of the performance, that need she'd expressed to change the end because the audience might be depressed by such a pessimistic ending! Interestingly, after the performance, the audience composed mainly of teachers actually discussed the ending, finding it painfully truthful, and the actors had the chance to share their experiences, dilemmas and doubts. As to your question: it's not about mythologizing the process but about its dramaturgy, which I understand in terms of a cognitive path. That's where the critical edge of our performances rests. In this sense, during the working process we learn to share responsibility among all participants of this process. It's a rare ability and, after all, it is the foundation for building civil society. JS: Of course, some things are important to us and we want to keep them within the structure of the performance. Not everything, clearly! It's always a decision we have to make then present to the group. In the process of working on The Teaching Staff, one teacher backed out of the project, another gave up that occupation, and a third, who'd wanted to back out of the project, stayed with us until the end then started studying theatre pedagogy, which she eventually gave up after one year. The programme we proposed turned out to be inconsistent with her expectations and needs in the area of theatre education. ZS: What exactly was that conflict of values about? JS: Theatre pedagogy as we understand it encourages teachers and artists working with amateurs to open up to the needs of groups with which they work, rather than staging ready-made scripts, the common schematic models for school plays, celebrations and assemblies. We also enhance our students' critical approach to their own work. Students are taught by such theatre artists as Wojtek Ziemilski and Rafał Urbacki, and by theatre pedagogues from the Association of Theatre Pedagogues. None of them work with ready-made scripts – they are interested in activities which have both artistic and research components, which would introduce a new perspective. They want to unseal theatre conventions by introducing new subjects or new actors to the stage. ZS: You've mentioned how important it is for you to concentrate on the process rather than on a final product – the performance. However, with Theatre 21,7 though you function in different fields, conducting workshops and social actions, the core of your activities are performances. What pedagogical benefits do you see in concluding the process with a performance? JL-K: The situation in which the process didn't end with a performance never happened to us before, but it's possible that it will one day, precisely because of the level of openness and unpredictability we allow in our work. ZS: (teasingly)We've got the grant – and now what? JL-K: You always have to consider a particular group. For Theatre 21 actors, the fact that the process results in a performance is fundamental. After all these years, we know that the actors at a certain moment – two weeks before the opening night – begin to anticipate the performance very strongly. That moment when the company's actors speak to the audience, when they're in a communication situation in public space, is crucial for them. They really live and breathe for that, which is why their performances have this incredible energy. However, when we worked in the Stary Theatre in Kraków, one of the professional actors declared that rehearsals for him are most important. Performances that follow are only recreating that. So everything depends on the group we're talking about. JS: We are the theatre! A performance is a form and a way of communication with the audience. That's why we create educational activities and other social actions around performances. For Theatre 21 actors, performing on stage is also extremely important because it's their work – they get paid for it and feel the performance is a value to which they've contributed. Another important aspect here is, of course, the way in which the system of financing NGOs operates. The measurable effect of a project has to be a performance presented to audiences a certain number of times. And, third, opening night is very important to me, because without the deadline established by the premiere, it'd be difficult for me to conclude the process of intensive work. Here's how I think about the premiere: 'This is how much time we have to face this subject. We are at a certain moment, we create it with a particular group and the performance is a result of our common work'. So I treat the performance as a product created by the work of a certain group of people at a certain moment. Each time, I feel great joy that we managed to create something together, which doesn't mean each time we're equally satisfied with effects of our work and cooperation. That's why the creative process is only available to that group of people, and even if we talk about it with someone else, it's an experience which connects only us. ZS: Putting such emphasis on the process is also used to build the exclusivity of the group. JS:Yes, that's definitely the result of working with one group for twelve years. Exclusivity is one of those effects. We've been trying for some time to introduce new creators and artists to Theatre 21, and that's the direction we'd like develop for the project. ZS: Can you discuss in more detail the non-hierarchical model of work you mentioned earlier? JS: You ask about the non-hierarchical work model and I call it teamwork, or rather inviting the team to create. In Theatre 21, most of the time spent working on a production is devoted to improvisation. That's about three quarters of our working time in the process. It's the time when both actors and other artists can contribute to the production with their own propositions. The final performance is not, of course, the sum of all ideas. For me, the situation of an open beginning is important: a space for thinking about a given issue, open to actors and other artists, where as the work develops each participant enters his or her own area and focuses on that. The Indians, the production mentioned earlier by Justyna, evolved from two directions: a narrative of one actor who told a story about playing cowboys and Indians during Scout camp, and Native American protests at Standing Rock9 where, for the first time in over a hundred years, Native Americans were united by a common cause and the related Indian legend of the black snake. Along the Vistula River in Warsaw, protests concerning that issue also took place. Suddenly we found ourselves at the shore among people celebrating Indian rituals, we were singing with them and their song is at the end of our production. The woman conducting this ceremony came to our workshop and told our actors about the seven Indian directions of the world. One of those directions is the direction of our ancestors, and during that rehearsal, the actors started summoning all their deceased. You can see that we try to keep a very thin skin, though this means interfering deeply with the working process. THE INDIANS, directed by Justyna Sobczyk, script: Justyna Lipko-Konieczna, premiere: 9. 12. 2016, produced by Teatr 21, Nowy Theatre. Photographer: Grzegorz Press. ZS: Your story about The Indians seems very significant and can explain a lot to our foreign readers. The theatre pedagogy you teach at the Theatre Institute is closely connected to the Institute of Polish Culture at the University of Warsaw, where the anthropology of performance school directed by Prof. Leszek Kolankiewicz operates and where the programme of the animation of culture 'infected with ethnology' is developing dynamically, to paraphrase the title of a renowned essay by Kolankiewicz.10 Because of Kolankiewicz, who is an expert on Jerzy Grotowski and his anthropological practice, the relations between the Institute of Polish Culture and counter-culture traditions are very strong. This may also explain why your approach is marked by values of community, openness, lack of hierarchy, as if taken straight from the writings of Bogusław Litwiniec – a creator and director of the student theatre Kalambur and organiser of the International Festival of Open Theatre in Wrocław – whose texts from the 1970s about open art reflected counter-culture ideals.11 Do such contemporary discourses as critical theory, for example, which is much more sceptical towards the wide range of individual freedom, the potential for transgression and going beyond the repertoire of available social roles, fit into theatre pedagogy understood in this way? JL-K: In a way, we take those various exercises out of their counter-cultural context and use them for completely different purposes. The objective is to precisely reveal the framework within which we operate. Activities directed towards teens, especially, are designed to take a close and conscious look at ideological processes that we're a part of, because none of us are free from ideology. ZS: Maybe our conversation reveals the tension which currently exists within theatre pedagogy itself. Perhaps it hasn't found a satisfactory answer to its own question about how to empower a viewer or a student and provide them strength for social change, but without selling them an illusion of reality, which will never be as open as theatre pedagogues might wish. JS:Theatre pedagogues don't sell the illusion of reality! Some values are important to us and we want to create the space for such experiences in our work. Especially when we work with children or young people. Yes, I want in my theatre work to sustain a situation as close to democratic cooperation as possible, one requiring from its participants engagement and taking a stand. I'm interested in initiating an individual perspective and in order to do that you need a space which is safe and based on dialogue. Even if it doesn't always work out, I want to take this risk. It's not about creating an illusion. I treat theatre as a kind of lab where you experiment, try. So far, I've been especially interested in commonality, democracy – myths in their own right... The classroom carries a potential for community that's not supported or thematised at all by teachers. In the curriculum, teachers have form periods at their disposal. Often during these lessons, they follow topics from other subjects, while this should be time for focusing on situations related to that unique group of people. Its structure forms quite rapidly and often establishes roles for the entire term they'll spend at school. Of course, a theatre pedagogue is not a group-processes specialist, that's not the purpose of their work, but they should at least be aware of the processes taking place within a group. Theatre pedagogues usually focus on issues raised in performances seen by the young people, creating a space for practical reflection around them, using the language of theatre rather than a conversation between people behind desks. JL-K: Once, during a book fair, we conducted a workshop called 'School as Common Space' for an association school in Warsaw named after Jacek Kuroń [a legendary activist] – a school built on democratic values. We asked students to set up a spatial installation from the chairs, for which the opening idea was 'school'. Then we added another word to this idea: 'public', and asked participants to follow that combination and reshape the space. In the school designed as public space, the participants were supposed to formulate postulates as a group. This exercise turned out to be very difficult. The very process of using their voice in a postulative function towards their classmates and the group proved a great challenge. This demonstrates the serious problem we currently have in Poland with taking a stand, with speaking on our own behalf. And it's not about courage, but is rather about giving yourself the right to say what you need in this group, in this situation, towards others. ZS:And how does a theatre pedagogue determine his or her field of responsibility and their own right to take a stand regarding changes in the institutional theatre they work for? JL-K: I worked for several years in an institutional theatre. Such an institution, with its strongly established hierarchy and power relations, made it very easy to hide one's own needs and one's own attitude towards the employees' situation. This opens up a wide space for compromise and inertia, for resignation about shaping relations in this institution. What's the reason for not taking wholehearted responsibility for an institution I also co-create? JS: A theatre pedagogue in an institution is still an unfortunately rare situation. Often, they perform a completely different function, then may implement additional education projects. Their weak position in the theatre structure naturally influences the level of their engagement in activities of this institution and the sense of responsibility for it. There's one interesting and exceptional example on the theatre map: the Drama Theatre in Wałbrzych [in southwestern Poland], where Dorota Kowalkowska works as a theatre pedagogue, collaborating closely with the director Maciej Podstawny on their projects. The invitation came, of course, from the director. It's very rare in Poland: to think so seriously about combining the repertoire with educational activities, taking into account the creation of a vision of theatre but also the potential influence as an institution on the landscape in which it operates, in order to respond to the needs of the local community. ZS: How is the situation tragic? ZS: Do you mean that as a society and as a democracy, in the context of recent political changes, we're now in a moment when we should focus on the grassroots instead of 'playing' with revealing our own positions of power, deconstructing assumptions of theatre pedagogy, new discourses? JL-K: For me, the beginnings of working in theatre were connected to feminism and to this day feminism accompanies my work. When I started, there was no theatre pedagogy in theatre, only an education department. Before I met Justyna Sobczyk, I prepared a performance with Małgorzata Głuchowska, Córeczki [Daughters]. We invited young amateur actresses of fifteen and sixteen to play in our production and combined it with workshop activities addressed to young people. The idea of widely understood emancipation has accompanied my work since the beginning. JS: I heard about this kind of grassroots activity twelve years ago, when I came back to Poland after graduating in theatre pedagogy in Berlin. In Germany, a theatre pedagogue is a part of theatre's everyday reality, just like a dramaturge, while in Poland theatre pedagogues were placed in local community centres while in theatres the workshops were instructed by actors. At that time, young people were leaving my classes because they expected me to teach them how to become actors. I wasn't sure if my workshops were going to catch on, if there was the need for them. I also remember situations when young theatre artists rejected educational activities and argued that they don't need any explanation for their performances. The dialogue between artists and their audience was broken. Performances turned into closed conversations between insiders, and the contexts had become unreadable for the audience. The group of people had to come together; we had to work a lot at the Theatre Institute to establish the school for theatre pedagogues. We argued that it's not about explaining the meaning of performances but about introducing the language of theatre to viewers. We demonstrated how during a workshop situation, the text of a play is distributed and that text is further developed by means of improvisation or creative writing by participants who use their own voices. Centres for contemporary art implemented these kinds of projects a little earlier than theatres. Curators and educators in those centres were aware that the objective of a theatre pedagogue is not to teach specific skills, but is rather to conduct a conversation by means of the language of theatre. Theatre, not reduced to enunciation or acting, but as the right to be present in a public space. That's why I think that the groundwork has been done. ZS: How is this work that 'has been done' related to the tragic dimension of our current situation? Have your achievements been squandered? JS: Many things I believed in, some ideas and institutions such as church or family, which I've trustingly entered, virtually broke down – they don't exist anymore. And this is not only my personal experience. My children and their peers are functioning in a completely different family model.Despite the fact that the narrative offered currently by the conservative ruling party is trying to make it seem coherent, we, in our lives, can't deal with it – we experience more and more difficulty in maintaining the effort necessary to keep certain values or integrity. And in this context I believe the current social and political reality especially needs theatre pedagogues, who don't antagonize but rather demonstrate ways in which we are defined and determined by various factors such as economy and politics. Young people now entering adulthood will be in a more difficult situation than we were. Though they will not have to take mortgages and earn money for the most basic things like a place to live – I'm talking about Warsaw – it's precisely because of this they don't function within the myth of work, so they have to search for meaning in their lives by themselves. On the other hand, there's a mass of very poor people who'd answer the question about the meaning of their lives on the spot, but they have very limited resources to pursue it. ZS: In the face of these growing economic and class distinctions, what's the objective for a theatre pedagogue? JL-K: Perhaps it's about the groundwork that we still have to work on as a young democracy. It seems to me that there exists in Poland a fundamental myth: the distinction between public and private space. And when I talk about private space, I don't have in mind physical space such as home, as it's a distinction that's also present within institutions. It consists of the idea that some things shouldn't be taken outside the institution. This distinction is deeply rooted in Polish history and was strengthened during the PRL period [the post-war Communist era]. In public space, you could say things you didn't really believe, but this was compensated for in private space, where the myth of being yourself functioned. These two spaces never connected, because revealing your own beliefs would mean risking your career and harming your loved ones. Today, it's about finding inner courage to co-create public space in a personal way. To achieve that, we have to change our way of thinking about public space. Today it doesn't seem ours, as if it's been subjected to forces independent of us. This is on display with the current cutting down of trees.13 A legal act came into force allowing trees to be cut down on private property and when people began felling trees on a massive scale, the guilty ones were sought only among the government that introduced the act, which was the easiest way. A mature democratic community would also take responsibility for those individual clearings, as each of us makes such decision on our own and everyone can and should preserve the common good. As a theatre performance should be regarded as common good, not as something just belonging to some group of artists. Theatre pedagogy enables such a transition, of experiencing a performance from an intimate space into common space where we can meet with a group of viewers and compare our interpretations. ZS: How are your objectives and methods related to the personality and activities of Jan Dorman – who Justyna called in an interview the first Polish theatre pedagogue14 and who had already developed innovative ways to shape relations between school and theatre in his Eksperymentalny Teatr Dziecka [Experimental Children's Theatre] in Sosnowiec in the post-war period? In Dorman's book Zabawa dzieci w teatr [Children Playing with Theatre],15 he described one of his activities. He invited a group of preschool children to a theatre but, on their initial visit, only for the raising of the curtain and brief actor performances. Their second visit was longer and included one further element of performance – then during the third visit, the children began co-creating the production by instructing the actress about what she should do.16 This way, Dorman was building dramaturgy and arousing the need for theatre in children, while dismantling the conventional situation of 'going to a performance', which consists of serving children up with an appropriate dose of culture to satisfy the consciences of pedagogues and teachers. JS: I'd also believed that story but, as Dorman admitted, he made it up and it never actually happened.17 It says a great deal about Dorman as someone who did not want to be regarded as an authority. Dorman has certainly infected our thinking about theatre pedagogy. Before reading his texts, we only thought about theatre in schools as a kind of work on the side – but he argued that a good performance for children or young people would be just as good if staged in the school gym. Following that point, we've organised a contest named after Jan Dorman in the Theatre Institute, for productions created for schools. Another thing we drew from him was the idea that the theatre artist has to know the people for whom he creates works. Therefore, we include this in our curriculum about developmental psychology and alternative educational systems. Dorman sent his actors to preschools and schools with objects, including the famous duck, which they left there. The teachers' task was to observe how children behave when the duck appears, disappears, then after several days appears again as a character in a theatre performance the children attended. These are experiments and knowledge that remain unexplored by Polish theatre, as puppet theatre didn't explore the fact that Dorman had already removed the screen and revealed the actor-puppeteer in the 1960s. 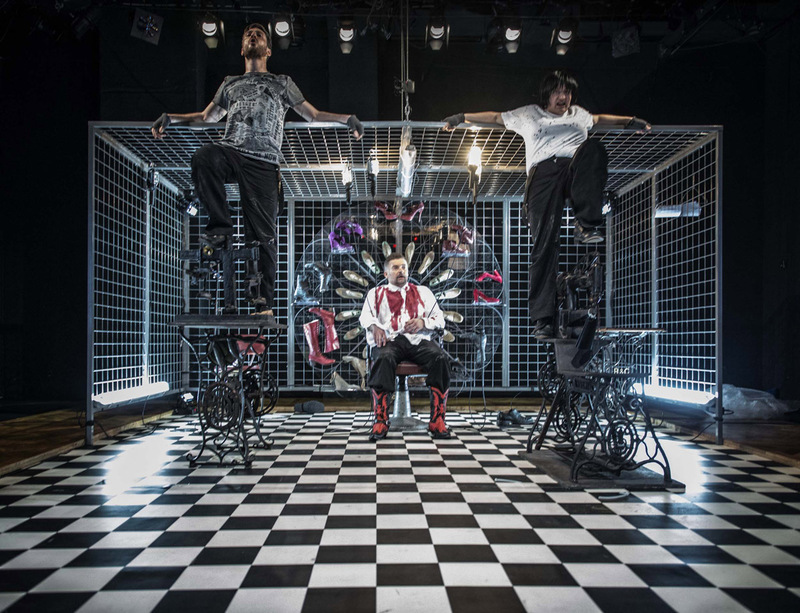 ZS: In 2012, you staged the production Jan Dorman’s Theatrical Playground together, which returns to his ideas for the first time in many years. Which of those ideas remain valid and which should be revised? JS: We're now implementing a project at the Theatre Institute to collect testimonies of people who met Dorman during various periods of their lives: students, actors, directors. They claim that Dorman told them to not do the 'Dorman'. His actions are even less suited for replication today. He created his theatre in a world in which children played with what they could find in their backyards: sticks, for example. Children today function in a completely different environment, and theatre must take this into account. However, Dorman's relevance lies in his idea that the theatre pedagogues must notice that today's children have smartphones glued to their hands, yet he or she can't criticise or even describe it. They have to understand this situation and use it, bring it into the theatre. They can't offend young viewers or workshop participants due to the fact that they can't sit through a performance, but must have in them a constant motivation to see viewers in the context in which they're living. JN DORMAN'S THEATRICAL PLAYGROUND, directed by Justyna Sobczyk, dramaturgy: Justyna Lipko Konieczna, premiere: 13.10.2012, produced by Zbigniew Raszewski Theatre Institute in Warsaw. Photographer: Marta Ankiersztejn. JL-K: In one of his programmatic texts, Dorman wrote that for him one way to create a performance inspired by some text is to tear down that work's composition at various levels. I'd broaden the scope of this idea: it's tearing down the composition of reality. This is how I perceive the task of a theatre pedagogue: to tear reality down and see it from the inside. ZS: Do you think theatre pedagogy understood in Dorman's terms, as the instrument of tearing down reality, could be used in working with professional actors preparing a production in a repertory theatre? What could tearing down the reality of a theatre institution from the inside mean in this context? JL-K: During our collaboration with the Stary Theatre in Kaków, preparing The Shoemakers, we were using instruments of theatre pedagogy and these aroused plenty of tension related to what's regarded as private and public by an individual. Actors felt seriously concerned whether the audience would be interested in what they had to tell them about their condition and about the condition of their profession. We worked a long time to capture this tension between the actor as public figure and as private individual. It was difficult to overcome because the actors regarded themselves as only a medium for characters. Their task was creating an illusion, while we were following assumptions fundamental for theatre pedagogy: that it's important to take a stand, to speak from your own point of view, to approach the subject personally. Our experience at the Stary demonstrates that theatre pedagogy can also reveal many things from inside a theatre institution. ZS: In my opinion, today's overstepping or erasing of boundaries between the sphere of public, professional activity and the private sphere also seems a bit problematic. We're facing an excess of these tendencies – for example, because of flexible work time that results in precarization. Have you thought that this maintaining the boundary between being at work and not being at work – for example, by the criterion of fiction – is perhaps a form of resistance against exploitation and occupational burnout? JS: We've noticed the same mechanism while working on a production, Ciałam działem [an untranslatable word game involving the Polish words for body and action], within the framework of the Mikro Teatr [Micro Theatre] project18 curated by Tomasz Plata at Komuna// Warszawa, in which Martyna Peszko and Magda Czerwińska performed. While the two of us were still guided by the idea that theatre is a sphere of risk, not everyone in the production team agreed in this matter. One actress attempted to convince us that in this uncertain reality and everyday life she needs security and it's something she's looking for in theatre. She wants to know what to do, she needs a director to tell her what to do and how to behave on stage because in real life nobody will tell us that. And at that moment it was really hard for me to argue with this statement. I felt a deep understanding for such an attitude. CIAŁAM DZIAŁAM (Micro Theatre), performed by Magdalena Czerwińska, Justyna Lipko-Konieczna, Martyna Peszko, Justyna Sobczyk, premiere: 2.07.2016, produced by Komuna// Warszawa. Photographer: Pat Mic. JL-K: 'You know when to enter on stage, you exchange your lines with your partner, then he reaches for his gun and after a moment you die' is a line from that performance. JS: A person decides to work in theatre because there at least he or she knows what to expect, while in real life they don't. JL-K: It's totally against Dorman's approach, whose ideas were constantly evolving, as can be tracked in his archive, preserved by the Theatre Institute. For him, each performance was another stage of development and this meant the constant questioning of his conceptions. Dorman had this kind of courage in him. He also tore down his own language. ZS: After almost ten years of battling for the institutionalisation of theatre pedagogy – a battle that's been won, I'll suppose – what are challenges faced by a theatre pedagogue working in a Polish institutional theatre today? JL-K: The biggest challenge is the fact that these are areas often treated instrumentally. There is an expectation on the part of directors or the programme team to write a good grant application so educational activities strengthen the project and enhance the theatre's chances of receiving financial support for a production. However, the production remains most important, not activities related to it which create its message. This area is still regarded as not serious, or as secondary to 'high art'. A situation in which a theatre pedagogue is invited to co-create the programme or the activities addressed to young viewers happens very rarely. The pedagogue receives the text on which the production is prepared, often without consultation, and he or she is expected to formulate an ideological explanation for it. Such activity is ineffective because it's not rooted in recognising the real needs of viewers. This is usually the case with big-budget projects. And secondly, there still exists a barrier between theatre and audiences for whom theatre as a field of action or cooperation is only made available reluctantly. The action 'Lato w teatrze' ['Summer in Theatre']19 is an exception, when theatres actually open for young people, but it's held after the season ends, which shows that this kind of hierarchy to which theatre artists are very attached is sustained. A situation at the Fredro Theatre in Gniezno in 2016 illustrates these relations quite well. The programme team and the theatre-education specialist created a project in which recognized theatre artists were invited to work with young people and introduce them to performance art by way of actions in public space. Afterwards, the participants were expected, inspired by knowledge acquired during workshops, to jointly create their own artistic action. Two female participants dressed in Muslim outfits entered Gniezno Cathedral during the liturgy. They also received the sacrament. Their behaviour aroused astonishment among people in the cathedral – but the storm broke out when the theatre's website published photos of the girls with the commentary that it'd been a theatre action. Importantly, the girls didn't publish those pictures and weren't the ones who turned the action into a marketing or PR campaign. When the local community began protesting, the theatre's managing director, Joanna Nowak, distanced herself from the action, shifting responsibility to the irresponsible and unaware young people. From the point of view of performance art – which participants had learned during the project initiated, after all, by the theatre – this action turned out to be effective. Actions by these young performing artists created a conflict but were also a model situation for analysing social mechanisms and working through difficult issues with young people. However, the first reaction of the adults – of an institution – was to run for cover, dissociate and distance themselves. The performers had to assume the role of scapegoat, then were additionally infantilized because the official message denied those actors their awareness of what their actions might cause. As a result of the Fredro director's reaction, conflict within the institution grew to the point where the part of the team which didn't agree with the theatre management and their handling of the crisis left the institution: the theatre pedagogues and the artistic director. A group process initiated by the theatre-pedagogy department didn't help, because not everyone was ready for an open, critical dialogue about attitudes that the crisis had revealed. The situation demonstrated that there's a huge gap between reality and any stated openness of management to pedagogues' actions. ZS: Again, we return to the tension within theatre pedagogy. This time, it's the tension between its ancillary role to an institution and that institution's marketing objectives – increase of attendance – and its critical function. On one hand, a theatre pedagogue may want to conduct an open discussion with the audience, including power mechanisms in the theatre; on the other hand, they must be careful not to provoke an exodus of viewers. Critical thinking can become an instrument for a theatre pedagogue only so long as it has 'positive value, constructive, not assuming the disintegration or framing of someone into a situation they do not want to be in'.20 Perhaps this is what Christoph Nix had in mind about contemporary theatre pedagogues, that when they use the expression 'critical thinking' they simplify and downgrade the Enlightenment idea of scepticism, which may be dangerous for institutions and the authority of adults.21 For the sake of honesty towards the audience and the postulate of their emancipation – so often repeated by theatre pedagogues – shouldn't we develop a parallel, non-institutional movement of theatre pedagogy which would offer truly critical actions? I don't have in mind actions or theatre workshops taking place outside the institution of theatre, in a different context – they've been taking place for a long time. I mean workshops around performances with audiences, which wouldn't be commissioned or controlled by directors of theatres or festivals. JS: The situation of commissioning, as you put it, of workshops or performances with audiences by institutions is a gesture of openness to theatre pedagogy in general, and that makes us happy! Situations of censoring our actions are rare, though in the case of controversial projects, we can't bear their burden, describe them, create a discussion around them. You say that, for the sake of honesty towards audiences and their emancipation, a parallel non-institutional theatre pedagogy should be developed... Of course! We began our activities in a specific moment in Poland, in the newly established Theatre Institute, and it required great effort to convince artists to work with children, young people, audiences. You always build on something, and against something... It's so natural! This is what development is about! I'm very curious about further developments in theatre pedagogy, and hope we'll not fall into the trap of schematism – though knowing many theatre pedagogues in our country, I sense we can witness situations in the future which will surprise us, outrage us, lead to conflicts... It's important for me that we keep asking ourselves questions about meaning and take care not to slip into the trap of complacency. Thank you very much for this conversation. 'Daleki punkt dojścia. Rozmowa z udziałem Justyny Czarnoty, Alicji Morawskiej-Rubczak, Doroty Ogrodzkiej, Anny Rochowskiej, Justyny Sobczyk, Igora Stokfiszewskiego i Magdaleny Szpak', Dialog, 7–8 (2016). Dorman, Jan, ‘Zabawa dzieci w teatr’ (Warsaw: Centralny Ośrodek Metodyki Upowszechniania Kultury, 1981). Kolankiewicz, Leszek, 'Teatr zarażony etnologią', Polska Sztuka Ludowa. Konteksty, 3–4 (1991). Nix, Christoph, 'Nauka stawiania pytań', trans. Magdalena Szpak, Dialog, 7–8 (2016). ‘Zrobić coś dobrego. Rozmowa Piotra Morawskiego z Justyną Sobczyk', Dialog, 4 (2016). Żmijewski, Artur, ‘Oni’, 2007, https://www.youtube.com/watch?v=YoEkWhuh6a4 [accessed on 30 April 2017]. 1. See the Association of Theatre Pedagogues website: pedagodzyteatru.org. 2. See Ewelina Godlewska-Byliniak, Justyna Lipko-Konieczna, 'Public to Private: A Theatrical Game with Disability', Polish Theatre Journal, 2 (2016), www.polishtheatrejournal.com [accessed on 30 April 2017]. 3. Justyna Sobczyk, Justyna Lipko-Konieczna, 'Pedagogika teatru – pole wysokiego napięcia', unpublished interview. 4. Szewcy [The Shoemakers], based on Stanisław Ignacy Witkiewicz, dir. Justyna Sobczyk, playwright Justyna Lipko-Konieczna, premiered on 11 March 2017 at the Stary Theatre in Kraków. 5. The film documenting Żmijewski's Oni is available at www.youtube.com [accessed on 30 April 2017]. 6. The education reform – called the 'deform' by its opponents – initiated by Minister of Education Anna Zalewska in Prime Minister Beata Szydło's administration, will be implemented on 1 September 2017, closing down middle schools (introduced in 1999 by the Jerzy Buzek administration) and returning to the system of eight-year primary schools and four-year high schools. Compulsory education will be shortened from nine to eight years, with new core curriculum required at every education level, as well as new textbooks. See new regulations regarding education and preventive content of the new core curriculum at men.gov.pl [accessed on 30 April 2017]. 7. Theatre 21 is discussed in Ewelina Godlewska-Byliniak and Justyna Lipko-Konieczna's article 'Public to Private:A Theatrical Game with Disability', Polish Theatre Journal, 2 (2016), www.polishtheatrejournal.com [accessed on 30 April 2017]. 8. Indianie, Teatr 21, dir. J. Sobczyk, playwright Justyna Lipko-Konieczna, www.nowyteatr.org [accessed on 30 April 2017]. 9. See ‘Native Americans take Dakota Access pipeline protest to Washington’, The Guardian, 10 March 2017, www.theguardian.com [accessed on 4 August 2017]. 10. Leszek Kolankiewicz, 'Teatr zarażony etnologią', Polska Sztuka Ludowa. Konteksty, 3–4 (1991). 11. See Bogusław Litwiniec, ‘Teatr młody, teatr otwarty’ (Wrocław: Zakład Narodowy im. Ossolińskich. Wydaw. PAN, 1978). 12. 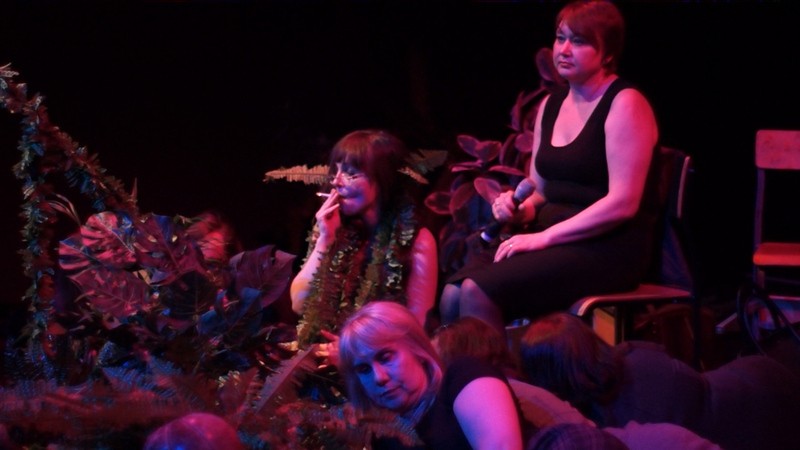 Mała scena by Akademia Ruchu took place on 22 December 2014 at the Theatre Institute in Warsaw. 13. A new environmental law called 'lex Szyszko' (after Minister of the Environment Jan Szyszko) took effect on 1 January 2017, relaxing regulations for clearing trees and bushes on private property. The Polish Ecological Club estimates that in the first two months of the new regulations, a million and a half trees were cut down. In late April 2017, under pressure exerted by urban activists, new regulations restricting these clearings were introduced. 14. ‘Zrobić coś dobrego. Rozmowa Piotra Morawskiego z Justyną Sobczyk', Dialog, 4 (2016). 15. Jan Dorman, Zabawa dzieci w teatr (Warsaw: Centralny Ośrodek Metodyki Upowszechniania Kultury, 1981). 16. Dorman, 'Opowiadanie o koniku', in Zabawa dzieci w teatr, pp. 97–99. 17. Dorman, 'Muszę się wytłumaczyć', in Zabawa dzieci w teatr, pp. 100–102. 18. For the Mikro Teatr project, several recognized Polish theatre-makers prepared short performances (sixteen-minute durations) subject to strictly determined production rules. 19. 'Summer in Theatre' is a programme implemented by the Theatre Institute in Warsaw since 2008 and funded by the Ministry of Culture and National Heritage for theatres, cultural institutions managed by local governments, and NGOs interested in organizing theatre workshops for children and young people during summer holidays ending with a performance. The most interesting projects receive grants of up to 40,000 zloty (about 9,500 euro). 20. 'Daleki punkt dojścia. Rozmowa z udziałem Justyny Czarnoty, Alicji Morawskiej-Rubczak, Doroty Ogrodzkiej, Anny Rochowskiej, Justyny Sobczyk, Igora Stokfiszewskiego i Magdaleny Szpak', Dialog, 7–8 (2016). 21. Christoph Nix, 'Nauka stawiania pytań', trans. Magdalena Szpak, Dialog , 7–8 (2016).